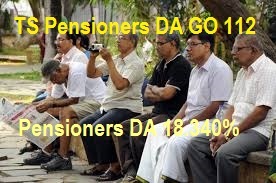 Pensioners New DA GO 112, TS Pensioners Enhanced DA 18.340% Table, Telangana Government sanctioned Latest Jan 2016 Pensioners Dearness Relief increased 3.144% from 15.196% of the basic pension to 18.340% of the basic pension from 01.01.2016. Telangana Pensioners Dearness Relief to Pensioners with effect from 01.01.2016 – Revised - Orders – Issued. Telangana FINANCE (HR-5-Pension, GPF) DEPARTMENT G.O.Ms.No.112 Dated: 08.09.2016. 5. G.O.Ms.No. 130 Finance (HRM.V) Department dt.16.0 9.2015. (i) Those who retire d from service after 01.07.2013 and are drawing pension in the Revised Pay Scales,2015. (ii) Those who retire d prior to 01.07.2013 and whose pension was consolidated in the light of orders issued in the G.O. 3rd read above. 2. Government also hereby order the revision of rates of Dearness Relief from 88.168 % to 93.304 % with effect from 01.01.2 016 to the pensioners who are draw ing their pension in revised pay scales, 2010 and not consolidated in terms of the orders issued in the reference 3rd read above. 3. Government also hereby order the revision of rates of Dearness Relief from 211.95 % to222.312% with effect from 01.01.2 016 to the pensioners who are dra wing their pension in revised pay scales,2005 and not consolidated in terms of the orders issued in G.O.Ms. No.100, Finance (Pen.I) Department, dated.06.04.2010. 5. Government also hereby order the revision of rates of Dearness Relief to the pensioners who retired while drawing UGC Pay Scales 2006 from 01.01.2006 from 119% to 125% w.e.f. 01.01.2016. 6. Government also hereby order the revision of rates of Dearness Relief to the pensioners who retired after 01.01.1996 drawing UGC Pay Scales 1996 from 234% to 245% with effect from 01.01.20116 since the Dearness Relief was regulated upto 01.01.2007 by merging 50% Dearness Relief with basic pension through G.O. (P) No.183, Finance (Pen.I) Department, dated.23.07.2007. 7. Government also hereby order the revision of rates of Dearness Relief to the pensioners/family pensioners Whose pension was consolidated as per orders issued in G.O.Ms.No.54, Higher Education(UE.II) Department, dated.08.06.2011and G.O.Ms.No.31, Higher Education(UE.II) Department,dated24.05.2013from1 19% to 125% with effect from 01.01.2016. 8. Government also hereby order the revision of rates of Dearness Relief sanctioned in G.O.Ms.No.4,Law(Law&JSC. F)Department,dated.06.01.2011 to the Pensioners whoa redrawing Pension as per Justice E. Padmanabhan Committee report from 119% to 125% with effec from 01-01-2016. (d) Those drawing family pensions under G.O.Ms.No.22 Finance & Planning (FW-Pen.I) Departmentdt. 16.11.1971, G.O.Ms.No. 104 Finance & Planning (FW-Pen.I) Department dt. 13.04.1973 and G.O.Ms.No.25 Finance & Planning (FWPen. 12. The arrears of revised Dearness Relief to the pensioners shall bepaid along with the pension of September 2016 payable on 1st October 2016. 13. All The Treasury Officers/ Pension Payment Officers shall work out and make payments of the Dearness Relief on Pension sanctioned in this order without waiting for further authorization/ instructions from the Accountant General(A&E), Telangana and Andhra Pradesh, Hyderabad, in Terms of the orders issued in the G.O.Ms.No.270, Finance & Planning(FW:PSC.I)Department ’dt. 7.10.1986. 14. All the Treasury Officers/ Pension Payment Officers shall work out and make payments of the Dearness Relief on Pension sanctioned in this order in terms of orders issued in G.O.Ms.No.122 Finance(Pen.I) Department, dt.22.05.2014. 15. The expenditure is allocable among the various States in accordance with provisions ofRule24oftheIncidence of Pension Rules in Appendix IIIB of the Andhra Pradesh Accounts Code, Volume-I. 16. In respect of the categories of employees who are not covered for payment through the Treasuries, the expenditure shall be debited to the Pension Funds of Zilla Parishadsand Pension Funds of the respective Municipal Councils. 18. The G.O is available on Internet and can be accessed at the address http://goir.telangana.gov.in.